The water on the bottom of the car is not as bad as different aggressive mixtures that watered the road for protection against ice. Such compositions are pretty much activate the processes of rust. The corrosion can cause the body serious damage up to through-holes. Treatment of the underbody of vehicles is a necessary measure in order to protect the metal from rust. The car will serve long and properly, if it fails to carry out such processing. Modern cars of foreign production for quite a while can do without special processing. Domestic models it is desirable to process immediately after purchase. 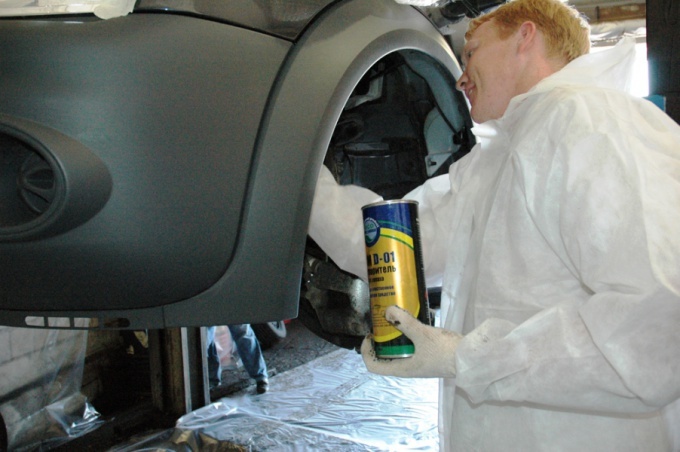 Used cars need regular and proper anti-corrosion treatment of the bottom. Passive form of protective equipment from rust implies that on the surface of the car body will be formed a protective layer. This protective film will become to separate the body from the effects of moisture. Part of such funds not included components that prevent corrosion. They only protect the body using the film, which is formed on the car body. The thickness of this film is not very big. As a rule, 2-3 mm, not more. Apply a thicker layer is unwise. Similar tools are almost always made on the basis of resins, mastics, bitumen, or elastomer. Active means to protect the body not only form a protective film, but also fighting against all forms of corrosion. Special tools are transforming manifestations of the rust to a stable compound phosphate. The composition of such assets include phosphoric acid, which is considered an ideal corrosion inhibitor. With regard to the texture means they can be pretty viscous (for example, different postmark) and be in liquid form and tend to be sprayed under pressure. As viscous and liquid formulations carry out their task about the same. But there are differences in the application method. Liquid spray formulations can quite easily get into anywhere. After the spray is formed a light mist of small drops. Even included a spray bottle is a long thin nozzle that can reach the most inaccessible places. Viscous anti-corrosion agents it is quite difficult to cover the closed cavity. Such compositions usually are applied by hand with broad brushes. For processing the outer sides of the arches and bottoms of shale mastic is used. After the use of formed bituminous film. It provides almost complete waterproofing of the body. The bottom of the wheel arch with internal and external parties, you can process rubber-bitumen mastic. In addition to corrosion protection, bitumen based mastic protects from bumps and gravel. Also the tool can withstand severe frosts. Mastic based on bitumen and rubber protects external and internal body parts, including unpainted surfaces - sills, arches, boot etc. The most popular means for corrosion control - Movil. He will protect all parts of the car body, including the joints and connections. Movil well distributed over the surface quickly forms a wax layer, expelling moisture. In addition to antikorom you can use the threshold autocomservice. Not only do they protect the sills of the car, but also will save from the aggressive anti-icing formulations doors, racks and other parts. Before using anti-corrosion means you need to properly prepare the surface of the body to spray anticorrosive. When applying the product it is obligatory to respect the recommended temperature and time mode. Under these parameters, corrosion protection and underbody will be most effective.